I love the parable of the persistent widow. I don’t mean any disrespect, but I think persistent is a nice word for crazy. This woman is crazy, but when the cause is a righteous one, it’s a holy crazy! We aren’t told what injustice took place, but she was on a mission. Maybe her son was falsely imprisoned for a crime he didn’t commit. Maybe the man who molested her daughter was still on the streets. We don’t know for sure. But whatever it was, she wouldn’t take no for an answer. And the judge knew it. The judge knew she would circle his house until the day she got justice or the day she died. The judge knew there was no quit in the crazy woman. Does the Judge know that about you? How desperate are you for the blessing, the breakthrough, the miracle? Desperate enough to pray through the night? How many times are you willing to circle the promise? Until the day you die? How long will you knock on the door of opportunity? Until your knuckles are raw? Until you knock the door down? The persistent widow’s methodology was unorthodox. She could have, and technically should have, waited for her day in court. Going to the personal residence of the judge crossed a professional line. I’m almost surprised the judge didn’t file a restraining order against her. But this reveals something about the nature of God. God couldn’t care less about protocol. If He did, Jesus would have chosen the Pharisees as His disciples. But that isn’t who Jesus honored. Jesus honored the prostitute who crashed a party at a Pharisee’s home to anoint His feet. Jesus honored the tax collector who climbed a tree in his three-piece suit just to get a glimpse of Him. Jesus honored the four friends who cut in line and cut a hole in someone’s ceiling to help their friend. And in this parable, Jesus honored the crazy woman who drove a judge crazy because she wouldn’t stop knocking. The common denominator in each of these stories is crazy faith. People took desperate measures to get to God, and God honored them for it. Nothing has changed. God is still honoring spiritual desperadoes who crash parties and climb trees. God is still honoring those who defy protocol with their bold prayers. God is still honoring those who pray with audacity and tenacity. And the crazy woman is selected as the gold standard when it comes to praying hard. Her unrelenting persistence was the only difference between justice and injustice. The viability of our prayers is not contingent on scrabbling the twenty-six letters of the English alphabet into the right combinations like abracadabra. God already knows the last punctuation mark before we pronounce the first syllable. The viability of our prayers has more to do with intensity than vocabulary. It has more to do with what we do than what we say. Don’t just pray about it; act on it. There are defining moments in life when we need to prove to God that we mean business - and I don’t mean “business as usual.” In fact, it’s only when “business as usual” goes out of business that we’re in business - the Father’s business. That’s when we’re on the verge of a spiritual breakthrough. Josh Sexton pastors a church plant in North Carolina called Relevant Truth Church. God is doing amazing things at RTC. People who wouldn’t darken the doorway of a church are finding a relationship with Jesus Christ at an indoor skate park that has been converted into a sanctuary. But like many church plants, there is more vision than money. RTC was facing the termination of their lease if they couldn’t come up with the $3,500 rent when Josh got an idea while reading The Circle Maker. One of the leaders at RTC relayed what happened. osh asked me to come to the front during a worship service. He handed me a can of spray paint and asked me to paint a circle on stage. That’s when Josh told us he wasn’t going to leave the circle until God made provision for the church. With his wife’s blessing, he brought in a bed and ordered a Port-a-John. All he had was his Bible and his prayer journal. Three times a day, his wife brings him meals. My wife and I live down the street, so we’re helping with the kids. I think Josh came to the place of desperation. If this thing was going to work, God was going to have to show up and show off. I really think he is planning on staying in that circle until God does something huge. Crazy huh? Crazy? Or maybe it’s not crazy! Maybe our normal is so subnormal that normal seems abnormal. Maybe we need a new normal. Bold prayers and big dreams are normal. Anything less is subnormal. And when bold prayers become the norm, so do the miraculous breakthroughs that follow. For the record, the Sanhedrin still exists in every organization, every denomination, and every church. But don’t let the nitpickers and naysayers keep you from doing something crazy if you know God has called you to do it. For the record, RTC didn’t just get a new lease on their building; they got a new lease on their faith! 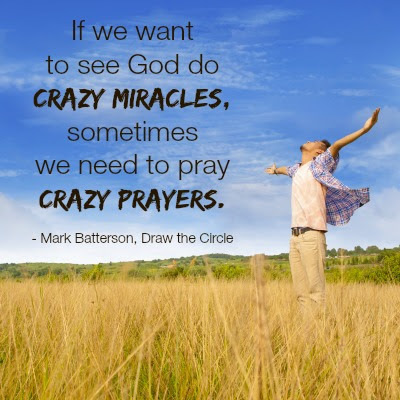 There is a pattern repeated in Scripture: crazy miracles are the offspring of crazy faith. Normal begets normal. Crazy begets crazy. 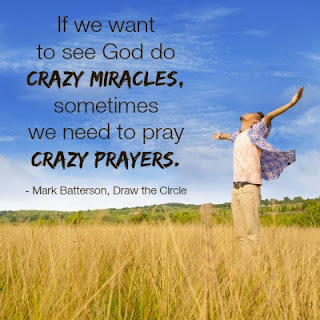 If we want to see God do crazy miracles, sometimes we need to pray crazy prayers. 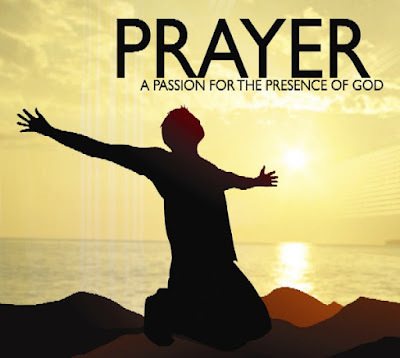 Bold prayers honor God and God honors bold prayers. Credit: Mark Batterson. Published by Zondervan.